"Forgot my iPhone 5S backup password, how to unlock it quickly?" As an iPhone user, you are always likely to create a password to protect your iPhone backup file. But once you forgot it, you can't use the backup to restore because iTunes keeps asking for a password to unlock the encrypted iPhone 5S backup file. Not until you enter the right password can you access the backup file and choose to Restore Backup…. Thus, you need to reset the forgotten iPhone 5S backup password in urgent. Here will illustrate three ways for you to achieve your goal. The best iTunes Backup Password Recovery is included. Note: Even you do a new backup, the password still exists. Every time you want to restore from your iPhone backup file, it asks you to enter the password. 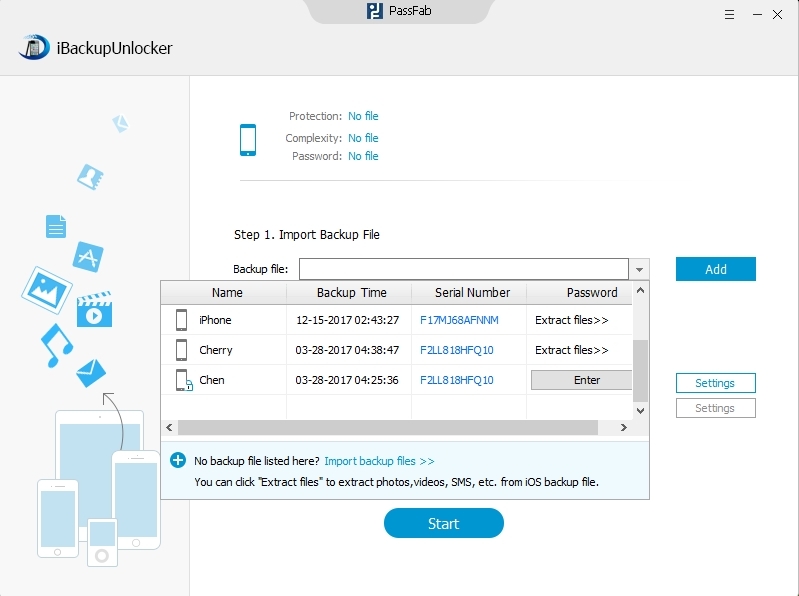 Actually, if you forgot password to unlock encrypted iPhone 5S backup, the only way to get back the password and the backup file is to use a third party program to crack the forgotten iPhone 5S backup password. Here we recommend the powerful iTunes Backup Password Recovery to you. It provides three efficient types of attack to reset the password. Moreover, no more prior skills are need. Just wait for a few seconds. Step 1. Download this password recovery tool and run it on your computer. Click Open. 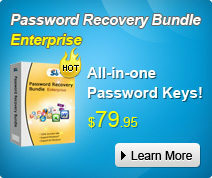 The location of the file you want to recover the password will be displayed automatically. Step 2. Choose one attack from three according to your requirement. Step 3. 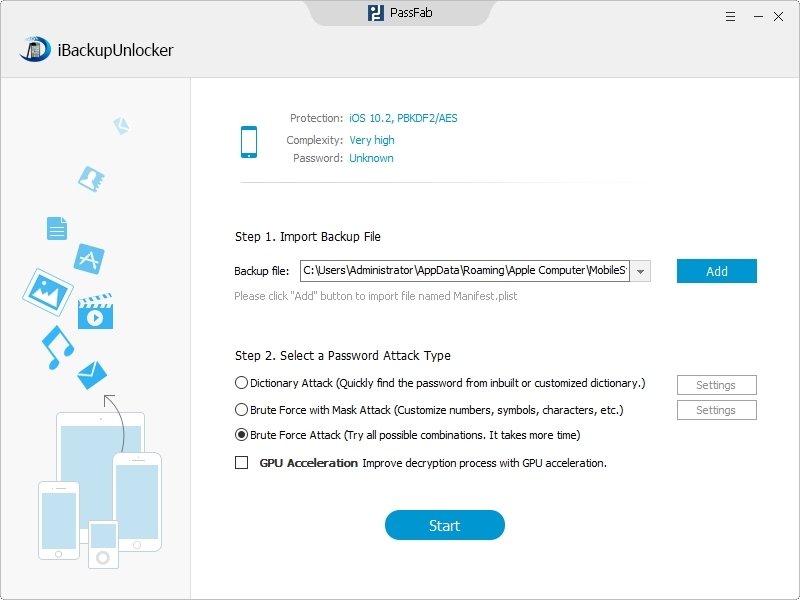 Click Start to begin the process of recovering the iPhone 5S backup password. This solution may be the last choice for you since you will lose all the files in your iPhone 5S. Once you perform to restore your iPhone 5S to its factory setting on iTunes, your iPhone 5S will be a new device. All the previous and precious data in it will be gone. But the Restore Backup function will be back. If this is not your idea, go back to turn to iTunes Backup Password Recovery for help. 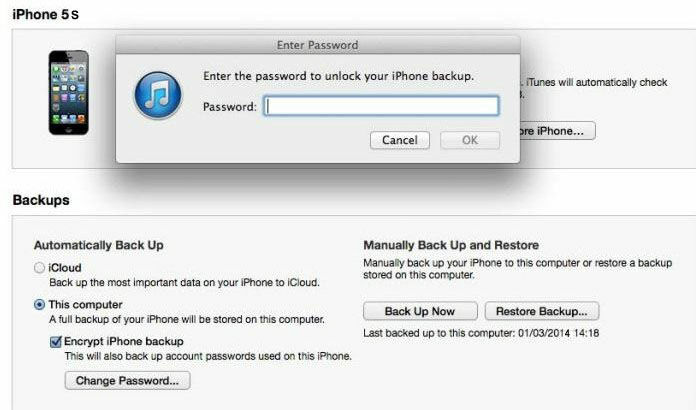 Added Info: How to Prevent Forgetting iPhone Backup Password? Write down your password to restore iPhone backup in iTunes on a post-it for safekeeping. You can take the most effective way. To use a password manager tool to help you remember and replay all your complex passwords. So don't panic when you forgot iPhone 5S backup file password, just give a keeping of this article and remember that you have three handy ways to crack it. Plus, you can have a total trust on iTunes Backup Password Recovery when you lost iPhone 5S backup password.